Rishikesh is better known to the West as the place where The Beatles went to meet their guru, the Maharishi, in the 1960s. Dr Chandra and Dr Roy were using their personal resources and, with some help from a local Ashram (a religious retreat or monastery), the Parmath Niketan, running free eye clinics from a small surgery within the Ashram. So VBA was launched in 2011 to support Dr Chandra and Dr Roy and their Australian team who were donating their time and skill to run to these free clinics. Fundraising for the project was predominantly provided through Fiducian Portfolio Services Limited, Indy Singh’s business, and private contributions. It was then approved as a Rotary Australia Worldwide Community Service (RAWCS) project and is now a registered Australian charity. VBA invested in renovating the operating theatre, providing operating tables, automatic microscopes, sterilizers and a Phaco machine formerly used by Westmead Hospital. 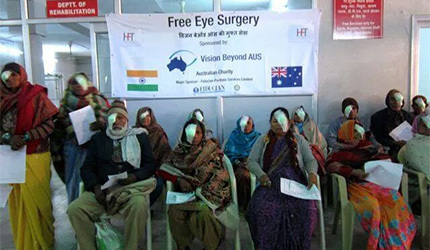 Then in December 2011 we sent our first team of 9 Australian surgeons, that included lead surgeons Dr Chandra and Dr Roy, and skilled volunteer anaesthetists and orthoptists. During that first clinic, 700 people received free medical consultation and 180 people received operations that restored their sight. 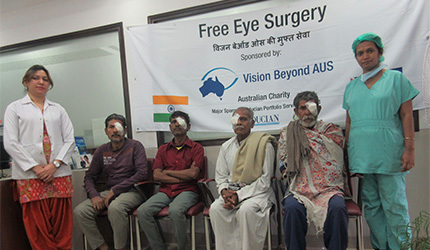 VBA still operates in Rishikesh, led by Dr Chandra and Dr Roy, and also offers the refurbished facilities to local eye surgeons we have worked with in our other Indian clinics, who are willing to volunteer their time to also help the helpless in Rishikesh. 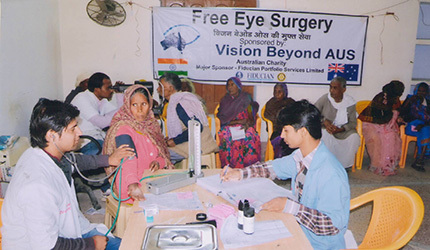 In mid-2013, VBA was approached for assistance by The Rotary Eye Care Hospital in Tughlakabad, which is on the outskirts of Old Delhi. After visits by Dr Roy and Indy Singh, it was decided that VBA should support them to provide free eye surgery to those people living below the poverty line or on less than a dollar a day. Dr Aarti Nangia, who operates from this hospital three days a week, and other surgeons who work from this hospital, are from time to time supported by local Rotary club programs, but required further reliable support for their humanitarian work. VBA supports the work of Dr Nangia and has ensured there is an ongoing programme of free eye care and surgery for the disadvantaged of Delhi and the surrounding rural areas. The outlying patients, who cannot easily get to Delhi from their villages, are screened by hospital-run clinics in their villages and then brought to the hospital for surgical treatment. After volunteering for VBA at our clinic in Wachet, Myanmar, Dr Sunil Thangaraj, a brilliant eye surgeon, approached VBA to support his work in Garivadi, a rural area near the city of Tiruchirapalli in South India. The people of Garivadi are desperately poor and very far from any means of medical treatment. The facility is The OEU-Lions Hospital, which operates as a Charitable Eye Centre with the bulk of the surgical work being cataract, glaucoma and corneal transplants. Surgeries conducted here are funded by VBA and are offered absolutely free. All treatment costs are fully funded by VBA, including admission, transport, surgery, medicines, and spectacles. Food is also provided to the patients free of charge during their stay. No patient is denied service on financial grounds – this is the basic principle of the hospital. Dr Thangaraj has delivered spectacular results, particularly with complex cases, and VBA is very proud to support his valuable work. Dr VB Pratap, a Professor and former head of the Department of Ophthalmology at the famous King George Medical College in Lucknow, India, was introduced to Indy Singh and VBA by a fellow VBA Director, Dr Shail Chaturvedi. Dr Pratap met Indy Singh in India and explained how he supported the humanitarian efforts of Kalyanam Karoti, the charity that operates the Deen Bandhu Netra Chikitsalaya (Eye Hospital) in Ayodhya. Ayodhya, is a holy city in south-central Uttar Pradesh state, situated on the Ghaghara River near the city of Faizabad in India. Dr Pratap is a trusted specialist in India and VBA was reassured that the quality and reliability of the work conducted by Kalyanam Karoti would meet VBA’s exacting standards. 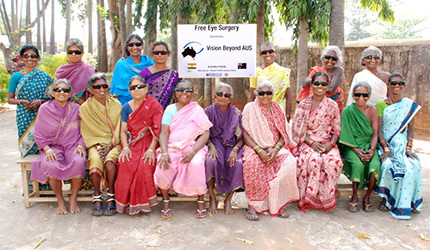 VBA has funded the humanitarian work of the local team from Kalyanam Karoti since early 2013, and will continue to support their efforts to restore the sight of the desperately poor of the region.